Find artworks, auction results, sale prices and pictures of Lyonel Charles Feininger at auctions worldwide. Lyonel Feininger German Expressionist Mixed Media Mixed media on paper, framed. Featuring a large kite in landscape scene. Signed Feininger and inscribed '52 on the lower right corner. Attributed to Lyonel Feininger (1871-1956, German). 30 x 47 cm (11.8 x 18.5 inches). Frame size: 50.5 x 67 cm (19.9 x 26.4 inches). 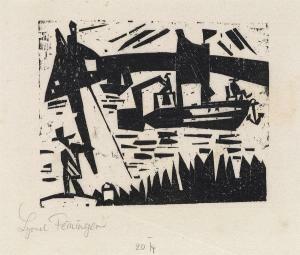 LYONEL FEININGER Angler und Kanalboot. Woodcut on tissue-thin cream wove paper, 1920. 111x136 mm; 4 1/2x5 1/2 inches, full margins. One of only several proofs. Signed in pencil, lower left, and with the artist's work number "2014" in pencil, lower center. A superb, richly-inked impression of this exceedingly scarce woodcut. We have not found another impression at auction in the past 30 years. Prasse 206. Lyonel Feininger BRÜCKE II (BRIDGE II) 1871 - 1956 signed Feininger (lower right); titled and dated Winter 1914-15 on the canvas overlap oil on canvas 81.4 by 101cm. 32 by 39 3/4 in. Painted in the winter 1914-15. Achim Moeller, Managing Principal of The Lyonel Feininger Project LLC, New York – Berlin, has confirmed the authenticity of this work, which is registered under no. 1246-12-23-13. The work is included inLyonel Feininger The Catalogue Raisonné of Paintingsby Achim Moeller under no. 140. Additional information for this entry was provided by The Lyonel Feininger Project, New York – Berlin. Estate of the artist, New York Julia Feininger, New York Estate of Julia Feininger, New York Marlborough-Gerson Gallery, New York / Marlborough Fine Art, London Private Collection (acquired in 1971) Private Collection, Switzerland A Charitable Foundation, Switzerland (sold: Christie's, London, 4th February 2014, lot 36) Purchased at the above sale by the present owner Exhibited Munich, Galerie Neue Kunst Hans Goltz, 48. Ausstellung: Lyonel Feininger, 1918, no. 12, illustrated in the catalogue Hagen, Folkwang-Museum, Lyonel Feininger, 1919 Dresden, Galerie Emil Richter, Lyonel Feininger: Sonder-Ausstellung seiner Gemälde, Aquarelle, Zeichnungen und Holzschnitte, 1919, no. 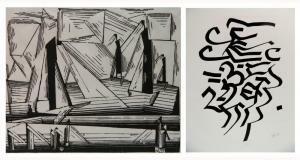 26 Hanover, Kestner-Gesellschaft, Paul Klee, Lyonel Feininger: Gemälde, Graphik, XXIX. Sonder-Ausstellung, 1919-20, no. 147 (as dating from 1914) Cologne, Galerie Goyert, Neue Kunst, 1920, no. 26 Weimar, Galerie Kunst der Lebenden, Schlossmuseum (on loan circa 1923-1930) Breslau, Gesellschaft der Kunstfreunde Breslau, Schlesisches Museum der Bildenden Künste, Lyonel Feininger, Erich Heckel: Gemälde, Aquarelle, Zeichnungen, 1929, no. 6 Essen, Museum Folkwang, Lyonel Feininger, 1931 Berlin, Nationalgalerie, Kronenprinzenpalais, Lyonel Feininger, 1931-32, no. 31 (as dating from 1913) Hannover, Kestner-Gesellschaft, Lyonel Feininger, 1932, no. 12 (as dating from 1913) New York, Buchholz Gallery; New York, Willard Gallery & Grosse Pointe, The Russel A. Alger House, Detroit Institute of Arts, Lyonel Feininger, 1941, no. 3 (as dating from 1912) Pasadena, Pasadena Art Museum, German Expressionism, 1961, no. 10 (as dating from 1914) New York, Whitney Museum of American Art; St. Louis, City Art Museum; Cleveland, The Cleveland Museum of Art; Philadelphia, The Pennsylvania Academy of the Fine Arts; Chicago, the Art Institute of Chicago & Buffalo, Albright-Knox Art Gallery, The Decade of the Armory Show: New Directions in American Art 1910-1920, 1963-64, no. 39 New York, Marlborough-Gerson Gallery, Lyonel Feininger, 1969, no. 9, illustrated in the catalogue (as dating from 1914) Zurich, Galerie Art Focus & Basel, Galerie Art Focus, Deutscher Expressionismus, Werke von 1905 bis 1930, 2001, no. 4, illustrated in the catalogue Zurich, Galerie Art Focus, Der Sturm: Herwarth Waldens 'Sturm' in Berlin, 2002, no. 24, illustrated in the catalogue Rome, Complesso del Vittoriano, Gli Espressionisti, 1905-1920, 2002-03, illustrated in the catalogue Literature Willi Wolfradt, 'Lyonel Feininger', in Junge Kunst, vol. 47, Leipzig, 1924, illustrated Hans Hess, Lyonel Feininger, London, 1961, no. 127, illustrated p. 259 Angriff auf die Kunst: Der faschistische Bildersturm vor 50 Jahre (exhibition catalogue) Kunstsammlungen zu Weimar, 1988, p. 15 Lyonel Feininger. Städte und Künsten: Aquarelle, Zeichnungen, Druckgraphik(exhibition catalogue), Marburg, 1992, p. 261 Lyonel Feininger. Gelmeroda: Ein Maler und sein Motiv (exhibition catalogue), Staatliche Galerie, Moritzburg & Von der Heydt-Museum, Wuppertal, 1995, p. 18 Florens Deuchler, Lyonel Feininger. Sein Weg zum Bauhaus-Meister, Leipzig, 1996, pp. 186 & 222 Lyonel Feininger: von Gelmeroda Nach Manhattan. Retrospektive der Gemälde (exhibition catalogue), 1998, p. 331 Expressionismus in Thüringen. Facetten eines kulturellen Aufbruchs (exhibition catalogue), Galerie am Fischmarkt, Erfurt, 1999, p. 429 Martin Faass, Lyonel Feininger und der Kubismus, series XXVIII, vol. 33, Fankfurt, 1999, mentioned p. 64 Lyonel Feininger: Drawings, Watercolours and Related Oil Paintings (exhibition catalogue), Marlborough Fine Art, London, 2002, illustrated Feininger und das Bauhaus: Weimar, Dessau, New York (exhibition catalogue), Hamburg, 2009, p. 184 Achim Moeller, Lyonel Feininger: The Catalogue Raisonné of Paintings, www.feiningerproject.org, no. 140, illustrated in colour One of Feininger\’s most accomplished and striking oils painted in the cubist manner, Brücke II was inspired by a small Gothic bridge over the Ilm river near Weimar, a region that provided some of the most iconic motifs in his work, including the churches of Gelmeroda and Vollersroda. During this time Feininger was living in Berlin and often visited Weimar, either alone or accompanied by his wife Julia. This area – which they both called \‘the promised land\’ – offered the artist the tranquility and solitude in which he could focus on his painting. \‘In the peace and quiet of Weimar and its surrounding Thuringian villages, untouched by modernity\’s psychic fragmentation and crisis of faith, Feininger found a subject matter that answered his lifelong yearning for harmony and oneness. Since childhood, churches, mills, bridges, and houses had evoked in him deep feelings of contentment, confirming his faith that everything in the universe was ordered, rational, and infused with Divinity\’ (Barbara Haskell in Lyonel Feininger: At the Edge of the World (exhibition catalogue), Whitney Museum of American Art, New York & The Montreal Museum of Fine Arts, Montreal, 2011-12, p. 50). Martin Faass recounts that it was Julia Berg, Feininger\’s second wife, who initially discovered the little bridge. In 1905-06 Julia, herself an artist, spent six months in Weimar for her studies, and during a walk discovered the bridge which connects the town with the suburb Oberweimar. Fascinated by the little Gothic bridge, she told Feininger, who was back in Berlin, so enthusiastically about it, that he wrote to her in anticipation of his first trip to Weimar: \“I can\’t tell you how much I am looking forward to seeing this bridge.\” Following a visit to Oberweimar the bridge would become one of the artist\’s favourite motifs from this region and over the following years was the subject of seven oils and several works on paper (M. Faass in Lyonel Feininger – Von Gelmeroda nach Manhattan (exhibition catalogue), Neue Nationalgalerie, Berlin & Haus der Kunst, Munich, 1998-99, p. 60). Painted between 1912 and 1919, Feininger\’s oils depicting the bridge trace the trajectory from his earliest Cubist-inspired style, which still retains his highly figurative, if stylised manner, to the more abstract, broken-down forms of his later painting. In the present oil, the diagonal of the bridge and its arches are still clearly recognisable, as are the colourful figures of fishermen in the foreground and the more sketchily rendered figures walking across the bridge. On the farther river bank, we glimpse the tree and the buildings of Weimar. In comparison to the 1913 oil Brücke I (fig. 1), which displays Feininger\’s characteristic prismatic rendering of form, the present work – depicting the scene from a higher vantage point – has a more complex and more purely cubist character. 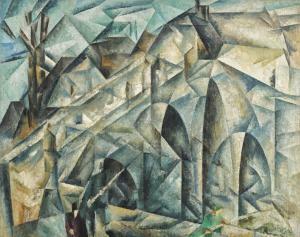 It was in 1912 that Feininger started incorporating lessons of Cubism into his own compositions. In April 1911 Feininger spent several weeks in Paris, where six of his paintings were shown at the Salon des Indépendants. It was during this visit that he first encountered the work of Cubist artists, and later recounted in a letter to a friend: \‘In the Spring I had gone to Paris and found the world agog with Cubism – a thing I had never heard even mentioned before. […] I saw the light. \“Cubism\” – \“Form\” I should rather say – to which Cubism showed the way. Afterward it was amazing to find that for years I had been on the right road… But only in Paris did I see and hear for the first time that such a thing existed\’ (quoted in Lyonel Feininger: At the Edge of the World (exhibition catalogue), op. cit., p. 48). Discussing the impact of Feininger\’s trip to Paris on his art, Barbara Haskell wrote: \‘Not until April 1912, a year after his introduction to Cubism, did Feininger begin to selectively incorporate into his work the style\’s geometric faceting of forms. Since his earlier paintings had consisted almost entirely of flat silhouettes, his only option for suggesting three-dimensional space had been to layer his forms. Now, in works such as Angler with Blue Fish II and Bathers on the Beach I, he broke his images into geometric planes seemingly tilted at varying angles to the picture surface. The approach resembled that of the Cubists, particularly Delaunay, whose Eiffel Tower [fig. 2] had been declared by the French critic Guillaume Apollinaire the most important entry in the 1911 Salon des Indépendants. Feininger\’s work differed from Delaunay\’s in rejecting fragmentation and simultaneity in favor of monumentality\’ (B. Haskell in ibid., p. 48). This monumentality is certainly present in Brücke II, which depicts the scene on a large scale and renders the modest stone bridge with a sense of majestic splendour. The broken down forms of the bridge and its surroundings are at once complex and legible, and in this Brücke II displays the strong influence of French Cubism, particularly the landscapes of Georges Braque (fig. 3) perhaps more than any other work from this series. The depiction of fishermen and walking figures adds an emotional and somewhat comical element that recalls Feininger\’s earlier style, a note that is absent from works of his Cubist colleagues working in Paris. Discussing Brücke I, the composition most closely related to the present oil, Ulrich Luckhardt wrote: \‘Bridge I marks an unmistakable turning point in Feininger\’s painting, wherein he moved to greater freedom of form. For the first time he succeeded in using the architecture of the arch, the rounded form, which he had so far avoided in the beach and architectural compositions that he had produced since 1912. Energy and rhythm needed to be redefined, new possibilities opened for the interplay of forms and perspectives. Although it was not to be the swinging lines themselves that he would develop consistently, their manner of extending the pictorial space was to become the decisive discovery on which the evolution of his entire œuvre was to be based\’ (U. Luckhardt, Lyonel Feininger, Munich, 1989, p. 80). 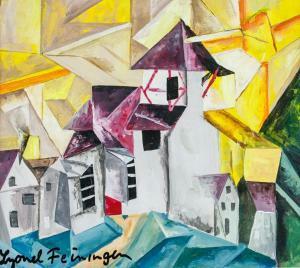 German-US Oil & Tempera Signed Lyonel Feininger Oil and tempera on paper. Featuring an abstract expressionist landscape scene. Signed Lyonel Feininger on the lower left corner. Stamped illegibly and inscribed 58 on the upper right corner, verso. 20 x 22.5 cm (7.9 x 8.9 inches). Frame size: 32 x 34.5 cm (12.6 x 13.6 inches). PROVENANCE: Southern Ontario estate Lyonel Feininger (1871-1956) was an American-German artist and member of the German Expressionist movement. Feininger work is often cited as combination of Cubism\’s angular shapes with Expressionism\’s emotionally charged paint handling. \“Each individual work serves as an expression of our most personal state of mind at that particular moment and of the inescapable, imperative need for release by means of an appropriate act of creation: in the rhythm, form, color, and mood of a picture,\” he once mused. Born Léonell Charles Feininger on July 17, 1871 in New York, NY, the artist traveled to Germany to study music initially, but once there turned his attention towards visual art. He studied at the Hamburger Gewerbeschule and the Königliche Akademie der Künste in Berlin where he was taught by Ernst Hancke. Feininger went on to exhibit extensively with both Wassily Kandinsky\’s Der Blaue Reiter group and the Berlin Secession. In 1919, the same year he made his famed work The Cathedral he accepted the invitation to teach at the Bauhaus school. Also a celebrated illustrator of comics, Feininger\’s graphic work was published in a variety of publications before he decided to exclusively pursued fine arts. The artist died on January 13, 1956 in New York, NY at the age of 84. He was notably the father of the photographer Andreas Feininger, whose celebrated black-and-white images documented the American landscape. Today, Feininger\’s works are held in the collections of The Museum of Modern Art in New York, the Phillips Collection in Washington, D.C., and the Kunstmuseum Basel, among others. FEININGER Lyonel , pittore e grafico statunitense di origine tedesca, nasce a New York nel 1871. Figlio di musicisti di origine tedesca si trasferì ad Amburgo nel 1887 per perfezionarvi gli studi musicali. Si iscrive infatti nello stesso anno alla Scuola di Arti e Mestieri di Amburgo, poi, l'anno successivo, si trasferisce nuovamente a Berlino. Nel 1891 studia all'Accademia di Berlino, che terminerà tre anni più tardi, nel 1894; è allora che inizia a lavorare come caricaturista politico, attività che gli riserverà una grande notorietà e notevoli apprezzamenti nell'ambiente artistico cittadino. Lavora per i settimanali satirici "Lustige Blätter", "Ulk", "Narrenschift". Più tardi, a partire dal 1905, Feininger si allontanerà progressivamente dalla caricatura, arrivando quasi a rinnegare il proprio passato. Soggiorno diverse volte a Parigi, dove studiò all'accademia Colarossi, fondata dallo scultore italiano Filippo Colarossi, in opposizione all'ufficiale Ã‰cole des Beux Arts, il cui spirito risultava ormai troppo conservatore agli occhi dei giovani artisti del tempo. A Parigi stringe rapporti con Robert Delaunay. Negli anni successivi viaggia molto, soggiorna a Londra dove sposa Julia, ritorna a Parigi, visita la Foresta Nera, la Normandia; quindi, nel 1908, rientra a Berlino. Il 1909 è l'anno della svolta, abbandona definitivamente la caricatura e si dedica esclusivamente alla pittura. Partecipa nuovamente alla mostra annuale della Secessione. Comincia a creare acquaforti e litografie, e nel 1911, di nuovo a Parigi, espone sei opere al Salon des Artistes Indépendants; nella capitale francese si avvicina al cubismo, grazie ai rapporti con Delaunay, e inizia a frequentare i loro circoli; ne condivide la ricerca costruttiva di scomposizione del reale, e il rinnegamento della prospettiva tradizionale, ma egli mira oltre una semplice ricomposizione in termini armonici, ricercando piuttosto una concentrazione degli elementi formali e cromatici che sia totalmente umana. La suggestione cubista, ad ogni modo, si fonde con la particolare sensibilità di Feininger, ancora legato alla lezione Fauves, e quindi estremamente aperto alle nuove tendenze dell'espressionismo tedesco. Infatti nel 1912 lavora all'atelier Zehlendorf a Berlino, ed entra in contatto con gli artisti del Die Brücke, stringendo amicizia con Erich Heckel, Karl Schmidt-Rottluff, e Alfred Kubin. Grazie al loro appoggio, partecipa nel 1913 all'esposizione dell'Herbstsalon. In seguito (1918), stringerà rapporti anche con il Novembergruppe. Visita la Turingia, tappa interiore, questa, molto importante per la sua pittura, dato che è a Gelmeroda che si delinea con maggior nitore quella che è la radice tematica della sua opera. Nel 1913 si trasferisce a Weimar, dove cominciò la serie di vedute cubofuturiste e di salda strutturazione architettonica della chiesa di gelmeroda ed espose al I Salone d'autunno della Galleria Sturm di Berlino, risaldando i suoi contatti con gli ambienti d'avanguardia che in quella galleria avevano un fondamentale punto di riferimento. Nel 1918 incontra Gropius; l'anno dopo, nel 1919, l'architetto fonda a Weimar il Bauhaus, e Feininger viene invitato, primo tra tutti, all'insegnamento. E', in fondo, l'approdo naturale di un artista come Feininger, tenendo conto delle sue complesse origini artistiche e del punto a cui è giunta la sua ricerca pittorica. E' sua la xilografia a corredo del manifesto del Bauhaus, dal titolo programmatico "La cattedrale del socialismo", dove è raffigurata una cattedrale sormontata da una torre in cima alla quale si congiungono tre raggi ad indicare le tre arti maggiori: pittura, scultura, architettura. I rapporti più stretti all'interno della scuola sono con Kandinskij e Klee, assieme ai quali infatti fonda il gruppo Die Blaue Vier, ovvero de I Quattro Blu, con l'apporto esterno di Alexei Javlenskij. Il gruppo raccoglie le esigenze di pittori che sentivano l'urgenza di distaccarsi parzialmente dalle tendenze maggioritarie del Bauhaus, tendenze che erano fondamentalmente rigore compositivo, riduzione del linguaggio alle forme e ai colori primitivi, indagine profonda dei rapporti cromatici o dei problemi di spazio e luce (Moholy-Nagy). Il Blaue Vier privilegiava invece la fantasia libera, e un'impronta spirituale che erano fondamentalmente eredità del Blaue Reiter. Ad ogni modo, quando nel 1926 il Bauhaus si trasferisce a Dessau, anche Feininger lo segue, proseguendo il suo lavoro all'interno del movimento. L'atmosfera politica in Germania si fa però sempre più incandescente e pericolosa. Già dal 1931 il Partito Nazionalsocialista, nella sua campagna elettorale per le municipali di Dessau, chiedeva la chiusura del Bauhaus, accusato di essere una istituzione rivoluzionaria e un ricettacolo di dissidenza e sovversione. Nel giro di un anno, i consensi dell'NSDAP raddoppiano e i nazisti giungono al potere nella Sassonia-Anhalt. Dopo la chiusura del Bauhaus a Dresda, e trasferito a Berlino, ma stavolta Feininger dà le dimissioni, con Alfred Arndt e Joost Schmidt. Feininger si trasferisce nuovamente a Berlino, ma tre anni dopo, il 6 maggio 1936, è costretto a lasciare la Germania; sua moglie Julia era in parte ebrea e debbono sfuggire alle persecuzioni. Rientra a New York; qui continua la sua pittura, che acquisisce un contenuto tonale di rinnovato vigore ma che progressivamente perde il tradizionale rigore geometrico di matrice cubista. La sintesi monumentale di un tempo si tramuta in un debordante cromatismo, liquido e vigoroso al contempo, in uno sfaldarsi crepitante delle forme e in un contaminarsi di velature che trovano splendida espressione nella tecnica dell'acquarello. Su tutto, un rinnovato senso grafico nella pittura, del resto del tutto naturale in colui che fu, come scrisse Georg Hermann nel 1901, "il miglior disegnatore di Berlino". Negli Stati Uniti espone moltissimo, nel Kentucky, nel Minnesota, ancora a New York, poi nel Michigan e nel Rhode Island. Al 1940 risale la serie di dipinti Manhattan. Nel 1944 il MoMA organizza una grande retrospettiva con 180 opere del grande pittore. Nel 1947 viene eletto Presidente della Federation of American Painters and Sculptors. Gli ultimi anni sono costellati di esposizioni e rassegne importanti. Nel 1956, il 13 gennaio, Lyonel Feininger muore.